French-owned conference production company Micemedia and Dutch event design business Slidebox make a decisive start to 2019 by launching their innovative Neuroshaping concept and announcing a closer working partnership. Neuroshaping is event design around the senses. The goal is to create a deep, lasting impact on the brain to increase desired memories, skills and states of mind, using storytelling, sound, visuals, lighting and situations. From the forms and tones in the stage design and signage to creative meeting spaces, unorthodox seating arrangements and even the fonts used in presentations, all aspects of an event can be managed to leave a longer-lasting impression in the minds of attendees. After pioneering the concept of Neuroshaping for conferences, Micemedia choose to partner with Slidebox to enable its execution. Micemedia, a company with employees in Belgium, France and The Netherlands and managed by Eric Antonisse, is specialised in production, consulting and supply for the MICE sector globally. They oversee all the technical elements of a congress on behalf of the client, a task that sometimes involves design – an area they prefer not to stray into. Slidebox, has evolved to focus solely on all aspects of design for conferences, presentations and events. Owner Menno Pleij develops strategies consistent with the client’s corporate identity to achieve their desired outcomes, using design and technology to enhance the experience and leave lasting memories. However, as a growing team, he needed greater production support. Neither Antonisse nor Pleij wanted to become a ‘Jack of all trades’ service, and both remain specialists in their fields. Meeting in 2013, they first worked together at the 2015 Global Foods Safety Conference in Malaysia, where Antonisse saw how their individual personalities and skills complemented each other, and in late 2017 he proposed a closer relationship. 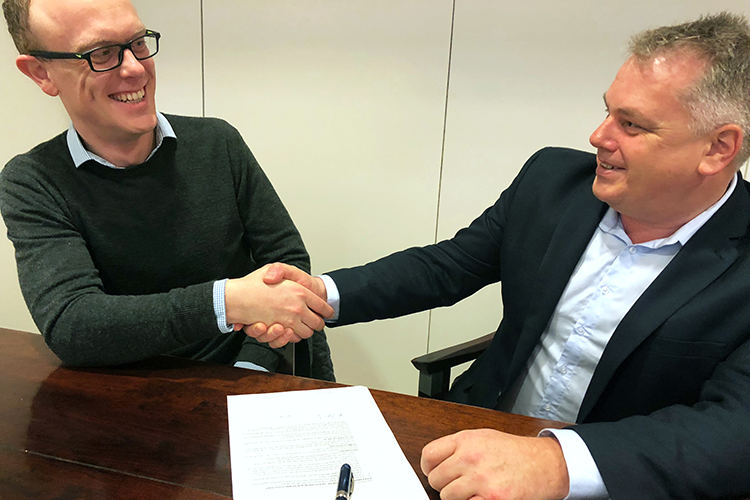 The long process of negotiation culminated last week with Micemedia and Slidebox signing a mutual partnership agreement. Jointly, the two companies are committed to a higher level of quality for conferences and events worldwide. Moving forward, Slidebox is taking the next step in partnership with Micemedia from their new office in Delft and will be known as: Slidebox – Impact By Design. Their first event as official partners is the next Global Food Safety Conference, running February 25-28 at Nice Acropolis Convention Centre, France, organised by Micemedia’s long-time client the Consumer Goods Forum. A top-tier 1,000-capacity congress for decision-makers and specialists from 50 countries.